It is always a pleasure to make reviews of Haute Couture collections because it makes us dream like no other fashion week. However, as much as I like to imagine impossible worlds with outfits like those seen on the catwalks, I must admit that a part of me will always feel the need to be a little grounded. In other words, I love whimsical, but not unattainable, unapproachable. That is part of my personality and personal taste, which will be reflected in this review. In addition, we wanted to leave aside some fashion houses that are frequent protagonists of this post (Elie Sab, Zuhair Murad, Chanel) and give space to others that for various reasons made merits to be discussed here (you'll see what I'm talking about later). 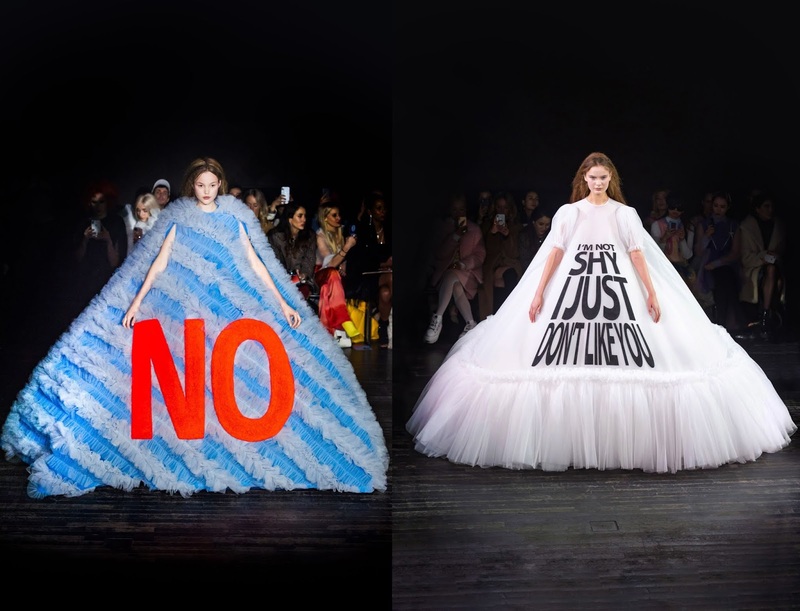 Finally, a couple of notes from my personal experience living in this city during the course of this week and circulating around some of its runway shows. 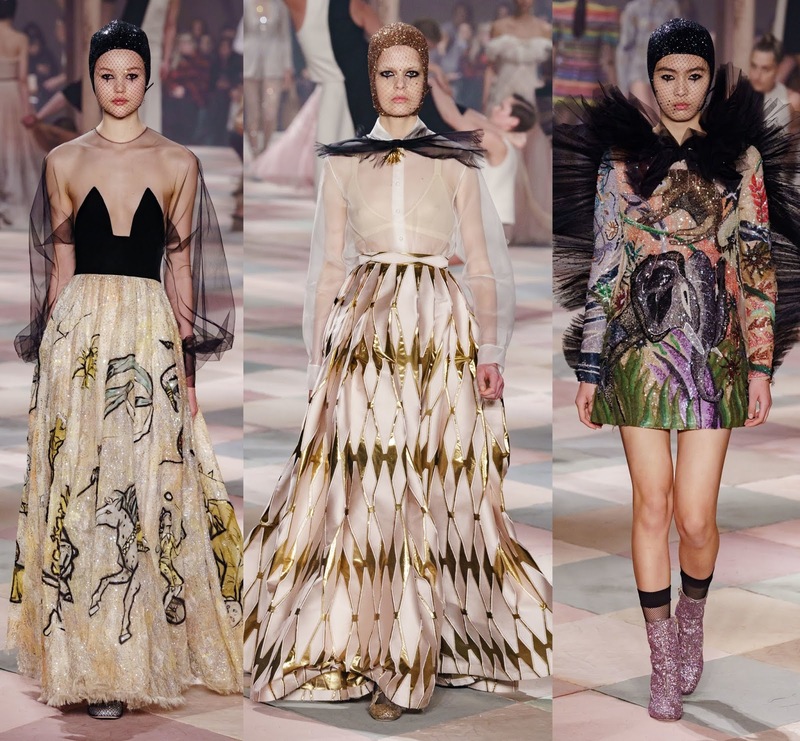 Maybe this is the collection that best reflects what I refer to as accessible fantasy (not because of the prices of a haute couture outfit, of course): that feeling of seeing something extraordinary and of absolute beauty, but that it has a connection with reality, with an "everyday" context inside which we can imagine ourselves. 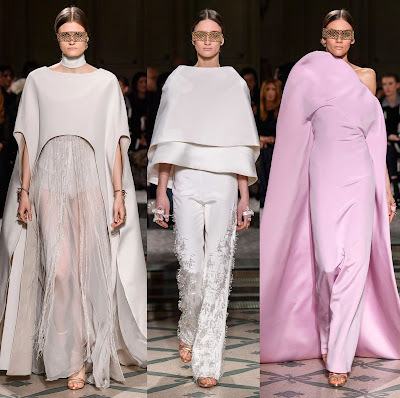 According to the designer, in conversation with Vogue, the collection sought to convey the essence of French couture, the Parisian chic, impeccable cut, with evident hours of craftsmanship, but without striking the ostentatious and too exuberant. 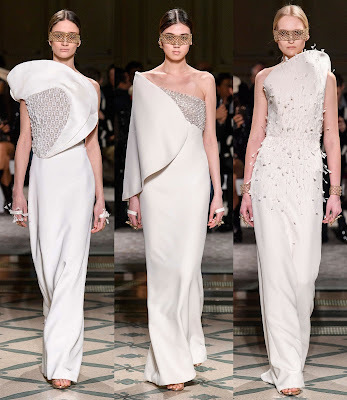 For me, it was clear in the exquisite details and appliquées, the measured use of volume and the balanced combination of tailored garments and clean lines with others louder and full of personality. 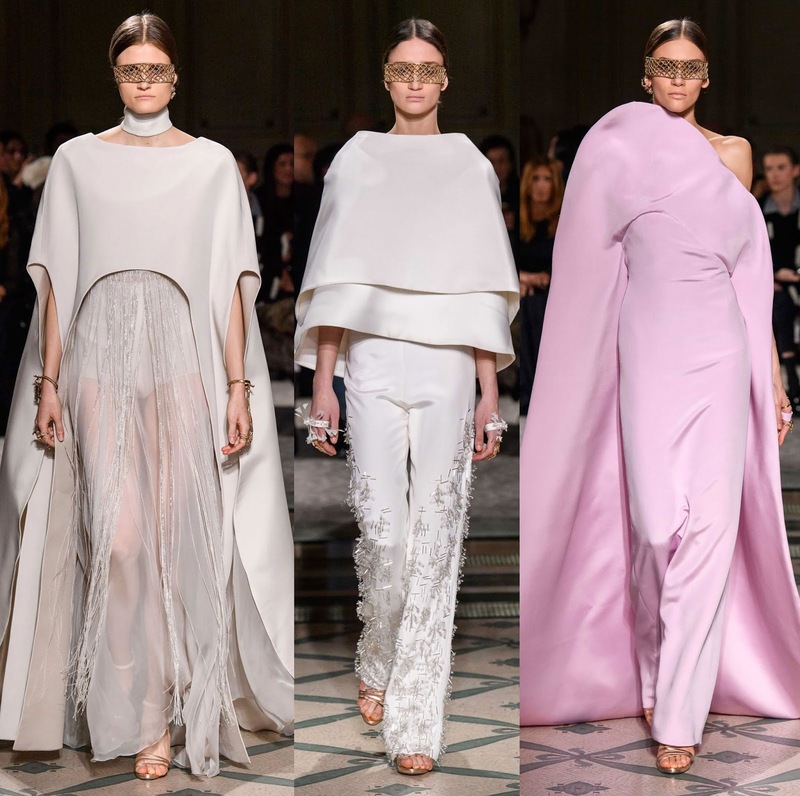 First time we reviewed the work of this Italian designer who participates as a guest in Haute Couture Week, and his work was a pleasant surprise for the authors of this blog. The way in which he combines fluidity and rigidity in the same garment with the creation of almost architectural silhouettes is a pleasure for the eyes. The color palette, the silhouettes and the finishes create a coherent but never boring collection, with constant surprises in the form of voluminous details, subtle glitter, perfectly placed appliquées and unexpected transparencies. We can say that it was love at first sight and we cannot wait to see more of his work in future editions. 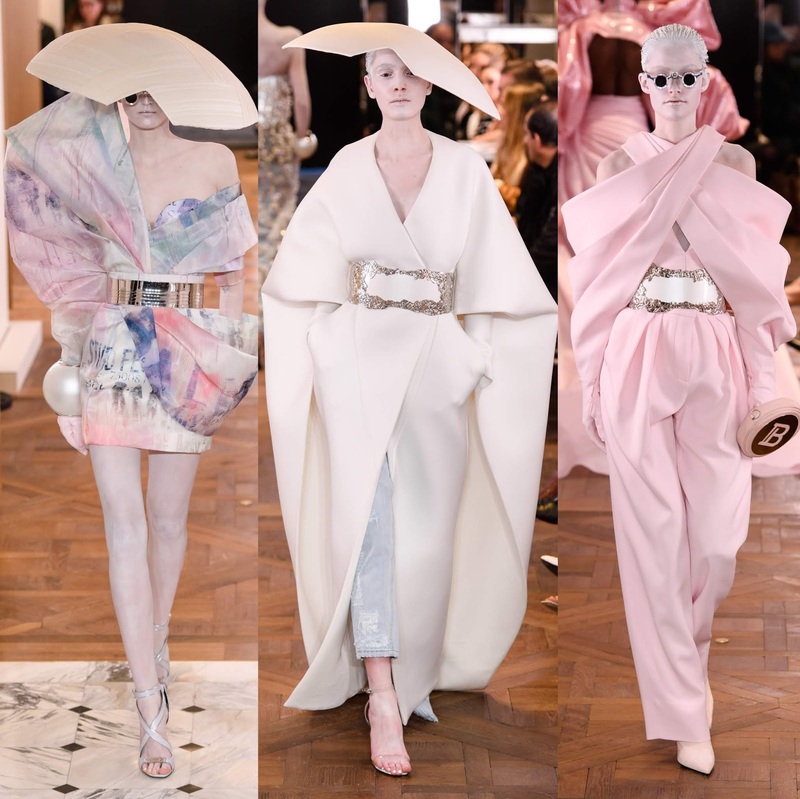 Under regular conditions we probably would have decided not to review this collection, but it was the "triumphant" return of the French fashion house to the Haute Couture calendar after many years, and in the hands of the renowned Olivier Rousteing. From the outset, it is clear that the theme of pearls is the protagonist (as it has been in other prêt-à-porter collections), but on this occasion the references were not just evident, but bordering on the obvious. 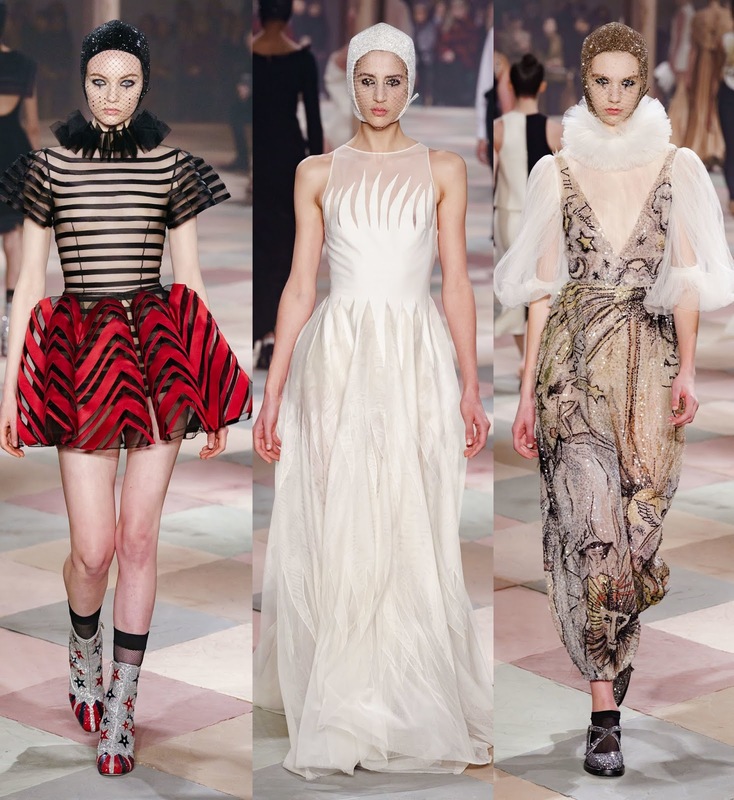 We have seen such exquisite pieces in those past prêt-à-porter collections that it was difficult to create something of superior level for Haute Couture, so —in my opinion— Rousteing bet on exaggeration and artifice: in volumes, silhouettes and details, which can be clearly seen in the first three photos of the collection that accompany this review. That type of pieces transmitted a sensation of much spectacle and little proposal, in addition to a costume-y taste (and that is considering the Maison Margiela show that same week), increased by the styling that I perceived as unfortunate and distracting. However, as the looks progressed, Rousteing's sophisticated hand was more visible and showed pieces that looked like a higher version of what the Balmain Army has worn in the past. This fashion house is recurrent in this post but we can’t help to acknowledge Maria Grazia Chiuri continues to surprise us. This time the theme was the circus in art and again she accomplished two things in a wonderful way: first, translating the subject into the set and ambiance in an interesting and meaningful way, thanks to the presence of a circus troupe composed completely by women. Second, to interpret the inspiration in the garments in a beautiful, interesting and fun way, without falling into the obvious: if you see the pieces together and in context, the circus is clear and obvious, but when you remove them, they have an identity on their own and do not look like a costume. Again a kind of grounded fantasy. To top it all, the hats, designed by master milliner Stephen Jones, are practically works of art, created, in his own words, to be "the exclamation point in the grammar of the silhouette". 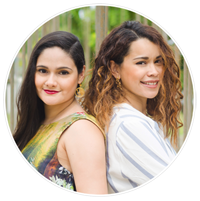 Another guest member fashion house that has become one of our favorites throughout the seasons. The way in which Tamara Ralph understands the female figure is for me one of her greatest strengths, and in this season she enhanced it inspired by the diva of Mexican cinema María Félix. This detail, I must admit, made me curious, since big fashion houses are not always careful with cultural nuances (the Dolce & Gabbana case), and my apprehension was exacerbated when I saw that there were mariachis welcoming the fashion show guests. 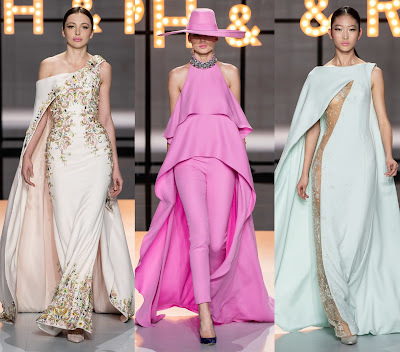 However, the inspiration is presented as a gentle wind that caressed the garments and that is not evident if it is not mentioned, and the result is exquisite pieces with a diverse palette with accents of color and sumptuous and sensual silhouettes. Some glitter, always present, alternated with prints and appliquées that, although at times distanced some looks from the main thread of the collection, brought interest and variety. 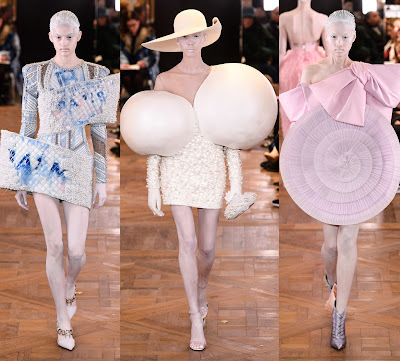 Just like Maison Margiela a year ago with its reflective garments that looked different depending on the intensity of the light, the rarity of the Viktor & Rolf collection is what makes it part of this post. 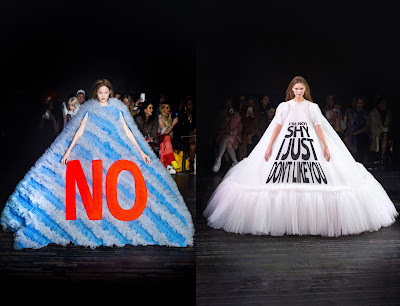 Its pictures were everywhere in social media and rightfully so: extremely voluminous tulle dresses with logos and texts in huge letters, some of them quite trendy, like "less is more" or "I 'm not shy I just do not like you". 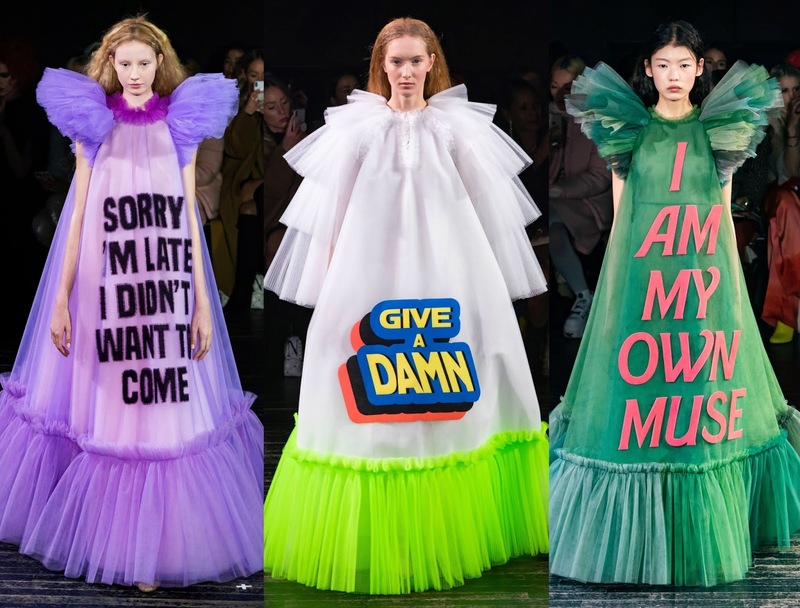 The collection was called 'Fashion statements' and according to the duo of designers the idea was that the clothes spoke for themselves, literally, but without them imposing meaning, leaving the door open for each viewer’s interpretation. In the end, the craft work (behind the noisy texts) is exquisite, of course, and the volume and color is clearly striking, but in my opinion the collection stays more in the form than in the substance, with the feeling that it meant to draw attention at all costs even more than actually making a statement about something. 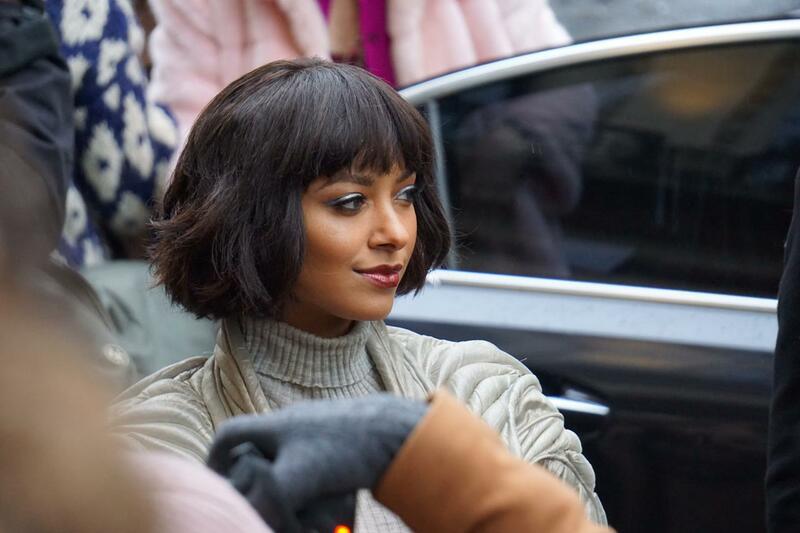 Kat Graham photographed by me in my attempt to be a paparazzi. To close, a bit about what Paris is in the middle of Haute Couture: being shorter and more exclusive than the prêt-à-porter fashion weeks, if one is not directly in front of a runway location, one does not find out that some of the most fabulous creations in the world are being presented in the city. But being at the entrance of one of the catwalks, it is more than clear: paparazzi and everyday people looking for the same thing, the possibility of seeing a celebrity guest as they arrive. For me it is always fun just to go people-watching: from famous celebrities who arrive with bodyguards and may or may not pose for photographers and the public, the "influencers" of the moment who of course are going to allow everyone to photograph them, the wealthy and anonymous clients of the fashion houses that have the purchasing power to pay for a custom made haute couture garment, to those that I call the true industry power players, those rarely recognized among the general public that wants to see a Kardashian but whose reviews and networks have the influence to stall or push forward the careers of the designers. But to be honest, nothing is more fun than seeing those who come with an outfit worthy of any street style blog, those who stop before anyone who asks them for a picture, who clearly spent hours thinking each detail of the look and who walk slowly to catch everyone’s eyes... and who finally arrive at the entrance of the show location and just turn around and leave the same way they came because they are actually not invited, they just wanted to get their picture taken. Publicadas por Moda 2.0 a la/s 7:06 a. m.